Pretty in Pale: The other end of the spectrum: How pale is too pale? The other end of the spectrum: How pale is too pale? Every day, one million Americans crawl into an acrylic clam shell and bathe themselves in UV light. Actress Olivia Wilde joked: "In a thousand years archeologists will dig up tanning beds and think we fried people as punishment." On the other side of the globe, women in Asia are going to opposite extremes, covering their faces with ghoulish masks to prevent their faces from tanning. According to a recent New York Times article, the rationale in China for protecting your skin is similar to American sentiment pre-1920: that women should have fair skin, otherwise you may get mistaken for a peasant. 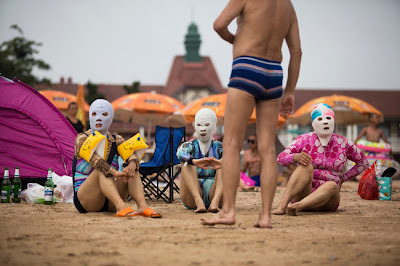 Not everyone in China wears these face masks--in fact, they're a bit of a novelty--but the cosmetics industry in China caters to women who want to lighten or preserve their fair complexion. This is reminiscent of 19th century Americans painting their faces with lead-based makeup and even resorting to blood letting (yes, you read that correctly), so that they looked more "beautiful." Whether it's bleaching our skin with harsh chemicals or bronzing ourselves with a bottle of baby oil, women across the world seem to value beauty over their health. And what is it that defines beauty, anyway? Is pale skin intrinsically more beautiful than tan skin? In my opinion, it's not. As evidenced by evolving trends in beauty, there is no right or wrong way to be beautiful--it all depends on what our culture deems desirable at any given point in time. Would today's so-called tanorexics probably be trying to lighten their skin had they been born just a few decades earlier? Or if they'd been born in China? Perhaps. Why is it that no matter when or where we're born, so many of us feel the need to drastically alter our natural appearance, just so that we can fit in with societal norms? I sure don't have the answers, but when I saw these photos in the New York Times article, I couldn't help but see the similarities between these two very different but extreme behaviors (excessive tanning and excessive sun avoidance). It all just seems so silly, although I know--especially from previous personal experience--how real the peer pressure we often face to look a certain way can feel. Great post Katie, thought-provoking, true, and well written.